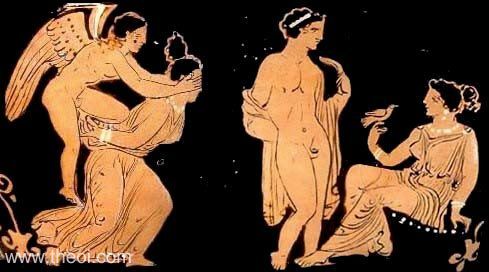 Eros (Love), riding a woman piggy-back (ephisdremos) while covering her eyes, drives her towards a suitor. The man is accompanied by the seated goddess Aphrodite who holds a dove in her hand. This image is montage of several photos of the vase.